Refractive surgery makes it possible to become free from glasses. This eye surgery with the excimer laser, can cure myopia, astigmatism, hypermetropia and presbyopia. Thanks to the laser energy, such vision flaws can be even cured at the same time, as for myopia and astigmatism, or hypermetropia and astigmatism. The ophthalmologist can, using the laser, mold the cornea with an incredible accuracy, curing myopia, astigmatism, hypermetropia and presbyopia. In some special cases where laser is not convenient, intraocular lenses are a possibility: there are several kinds that can be implanted inside the eye to overcome vision flaws as precisely as laser does. 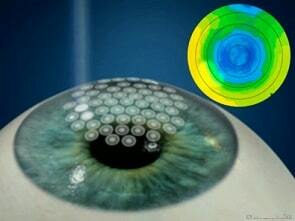 Curing high degree myopia for example, is possible thanks to the implant of phakic lenses.